Welcome to this week’s trailer round-up! What do you get when you combine a script co-written by James Cameron with the direction of Robert Rodriguez? We’ll find out when Alita: Battle Angel is released into theaters on December 21st! A24’s latest period piece, Mid90s, will be released into theaters on October 19th. This film is the directorial debut of Jonah Hill and, judging from the trailer, his film has got the 90s down. SNL comedienne Gilda Radner gets a much deserved tribute in Love, Gilda. This documentary will be in theaters on September 21st. Judging from the trailer, Final Score looks like it might be the best action film of 1992. It’s Die Hard in a stadium. The Eurotrash villains take 35,000 football hooligans hostage but everyone’s too much into the match to notice. At first, I thought this trailer had to be a parody. Speaking of things that seem like parodies but are actually meant to be taken seriously, Hunter Killer is a real movie starring two real Oscar winners. Keep an eye out for Gary Oldman and Common in theaters on October 26th. Finally, proving that not even bad reviews can keep a Marvel hero down, Netflix’s Iron Fist returns for a second season on September 7th. Today, we continue the 90s! Have you ever wanted to see Jon Stewart get stabbed in the eye with a hypodermic needle? If you answered yes, then 1998’s The Faculty might be the film for you! The Faculty takes a look at what happens when a new alien species happens to turn up outside of a painfully normal high school in Ohio. By painfully normal, I mean that Herrington High School is just as messed up as you would expect a suburban high school to be. The teachers are all underpaid and resentful of their principal (Bebe Neuwrith). Prof. Furlong (Jon Stewart) is the overqualified science teacher who will perhaps be a little too excited about the chance to examine a new alien species. Coach Willis (Robert Patrick) is the emotionally shut off coach of the school’s losing football team. Mrs. Olson (Piper Laurie) is the drama teacher who struggles to promote creativity in a school that’s more interested in blind conformity. Miss Burke (Famke Janssen) is the teacher who cares too much. And, finally, there’s Nurse Harper (Salma Hayek), who looks a lot like Salma Hayek. And, as typical as the teachers may be, the students are even more so. We get to know a few and they all neatly fit into the expected stereotypes. Casey (Elijah Wood) is the nerdy outcast who is regularly picked on by … well, by everyone. Deliliah (Jordana Brewster) is the status-obsessed head cheerleader who has just broken up with her boyfriend, Stan (Shawn Hatosy), because he quit the football team. Zeke (Josh Hartnett) is the school rebel, the kid who is repeating his senior year and who sells synthetic drugs out of the trunk of his car. Stokes (Clea DuVall) is an intentional outcast who pretends to be a lesbian and has a crush on Stan. And finally, there’s Marybeth (Laura Harris), a new transfer student who speaks with a Southern accent. When one looks over the top Texas filmmakers (director like Terrence Malick, Richard Linklater, Mike Judge, and David Gorden Green), Robert Rodriguez often comes across as being both the most likable and the least interesting. Like his frequent collaborator Quentin Tarantino, Rodriguez fills his movies with references and homages to other films but, unlike Tarantino, there rarely seems to be much going on behind all of those references. However, Rodriguez’s referential style works well in The Faculty because, along with acting as an homage to both Invasion of the Body Snatchers and John Carpenter’s The Thing, The Faculty also manages to tap into a universal truth. Or, at least, they seem weird when you’re a student. Now that I’m out of high school, I can look back and see that my teachers were actually pretty normal. They were people who did their jobs and, as much as I like to think that I was everyone’s all-time favorite, I’m sure that there have been other brilliant, asthmatic, redheaded, aspiring ballerinas who have sat in their class. My teachers spent a lot of time talking about things that I may not have been interested in but that wasn’t because they were obsessed with talking to me about algebra or chemistry or anything like that. They were just doing their job, just like everyone else does. But, seriously, when you’re a student, it’s easy to believe that your teachers have been possessed by an alien life form. Probably the best thing about The Faculty is the fact that the aliens cause the teachers to act in ways that are the exact opposite of their usual personalities. For most of the teachers, this means that they turn into homicidal lunatics. But, in the case of Coach Willis, this actually leads to him not only becoming a happy, well-adjusted human being but it also turns him into a good coach. Suddenly, Willis is getting emotional about the games, his team loves him, and he even gets a win! As for the film itself, it’s not bad at all. Lisa’s rating: 7 out of 10. To be honest, I wasn’t a huge fan of the first Sin City. I thought the movie, as a whole, dragged and all of the hard-boiled narration didn’t really work as an homage or a parody. I appreciated the film’s unique look and respected the fact that Robert Rodriguez and Frank Miller really did succeed in creating a very real cinematic world but, on the whole, the film just didn’t work for me. It was a movie that failed to leave me excited, offended, enthralled, exhilarated, or angry. Instead, I was just bored. Judging by how excited people online seem to be about Sin City’s upcoming sequel, I am very obviously in the minority. 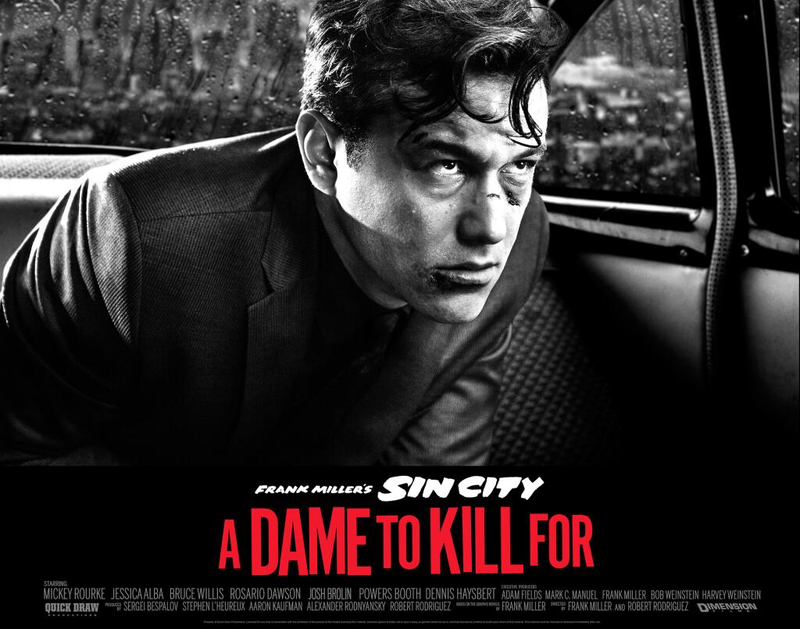 And, I have to admit, I’ll probably end up watching Sin City: A Dame To Kill For. After all, Joseph Gordon-Levitt is in it. I just hope that, unlike just about every character in the first film, he doesn’t end up getting disemboweled or shot in the head. Here’s the 2nd trailer for Sin City: A Dame To Kill For. Hard to imagine it’s been 9 years since the original Sin City hit the big screen. It was a comic book adaptation that many thought wouldn’t work, especially how Rodriguez envisioned it to be slavishly loyal to not just Miller’s dialogue but also his unique art style. The original film’s success quickly ramped up rumors that a sequel was already being planned using the second graphic novel in the Sin City series. Rodriguez himself stated he wanted Angelina Jolie for the role of Ava Lord, the titular “Dame to Kill For”, but after years and years of delay the role finally landed on Eva Green‘s lap (not a bad choice and one I fully support). So, we’re now going back to Basin City for more tales of booze, broads and bullets in this hyper-noir film that should be loved or hated in equal measures by those who have followed Frank Miller’s career. Once again the directing duties have been split between Rodriguez and Miller. Here’s to hoping that Miller has learned how to be a much better directer after his last film, The Spirit, tanked. Sin City: A Dame to Kill For is set for an August 22, 2014 release date.